The 82nd Annual American Legion Mountaineer Boys State will be held June 9-15, 2019 at West Virginia University Jackson’s Mill. Students will take part in creating the 51st State to the Union. 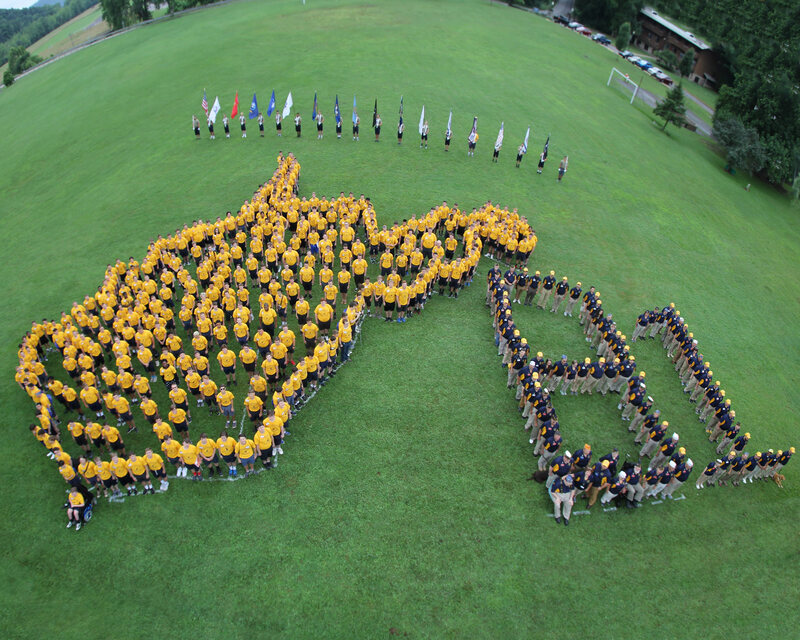 Founded in 1936, the goal of The American Legion Mountaineer Boys State (ALMBS) is to educate and train West Virginia youth in understanding one of the country’s most precious freedoms; the democratic form of government. ALMBS is characterized as “West Virginia’s Premier Leadership Academy!” Participants receive instruction and hands on experience in the governmental, political, and legal processes and participate in a variety of “career paths” that include Political, Legal, Banking, Law Enforcement (State Police and Natural Resource Police), Journalism (Broadcast & Print), Homeland Security (National Guard), Corrections, and Emergency Services. West Virginia proudly holds the 2nd oldest American Legion Boys State charter in the nation. ALMBS is sponsored by the nation’s largest wartime veteran’s service organization – The American Legion. For 100 years, The American Legion remains committed to mentoring and sponsorship of youth programs in our communities, advocating patriotism and honor, promoting a strong national security and continued devotion to our fellow service members and veterans - these are known as the Four Pillars of The American Legion: Veterans, Americanism, Youth and Defense. The American Legion 100th Anniversary mantra is “Legacy and Vision” – both a celebration of past accomplishments and a renewal of the organization’s resolve to serve communities, states and the nation for a second century. The American Legion Boys State program has been part of this national tradition since 1935. The 2018 ALMBS graduated 372 young men in the weeklong program from throughout the 55 Counties of West Virginia. The American Legion Boys State is a nationwide honors program developed to expose its participants to the rights, privileges, duties and responsibilities of a franchised Citizen. This summer leadership academy is objective and practical with city, county and state governments operated by the “Citizens” elected to the various activities. Activities include legislative sessions, court proceedings, law enforcement presentations, assemblies, bands, chorus, and recreational programs. In order to attend ALMBS, “Citizens” had to have completed their junior year in high school, be in the top of their class academically, demonstrate leadership ability, recommended by their local High School and selected by their local American Legion Post. Participants receive many benefits from this “Week that shapes a lifetime!” These benefits range from obtaining college credit, applying for scholarships, earning extra merit points towards attending the military academies, as well as, developing a diverse network of relationships across the state. Approximately 30,400 individuals have graduated from The American Legion Mountaineer Boys State in its 81 year history. To qualify to attend ALMBS, candidates must be a member of the male enrollment of the junior class; have at least a 2.75 grade point average or higher; have demonstrated outstanding qualities in the areas of school activities, community activities, and character; have never attended a Boys State program previously; and be a citizen of West Virginia or attend a high school in West Virginia. The American Legion Auxiliary holds the American Legion Auxiliary Rhododendron Girls State program at Davis & Elkins College for those female juniors who are interested in a similar program; more information on ALARGS can be found at https://wvgirlsstate.org. The American Legion proudly thanks those who donate to this program every year. “Citizens” can be sponsored by local businesses, individuals, or community minded organizations by contacting their local American Legion Post and letting them know they are interested in helping support the program. The cost to sponsor a young man to the program is currently $250 and recruitment efforts occur between January and April of each year. If it weren’t for the support of communities throughout the state, this program would not be as successful as it is. The American Legion salutes you!